Oh dear. Running back into my flat to retrieve my forgotten phone last Thursday evening, I put my beloved Icon Variant helmet on the countertop in my kitchen. A minute later, while grabbing it to leave, I experienced one of those slow motion, ‘nooooooooooooo’ moments as it slipped from my grasp and fell to the tile floor, making a sickening crack on impact. 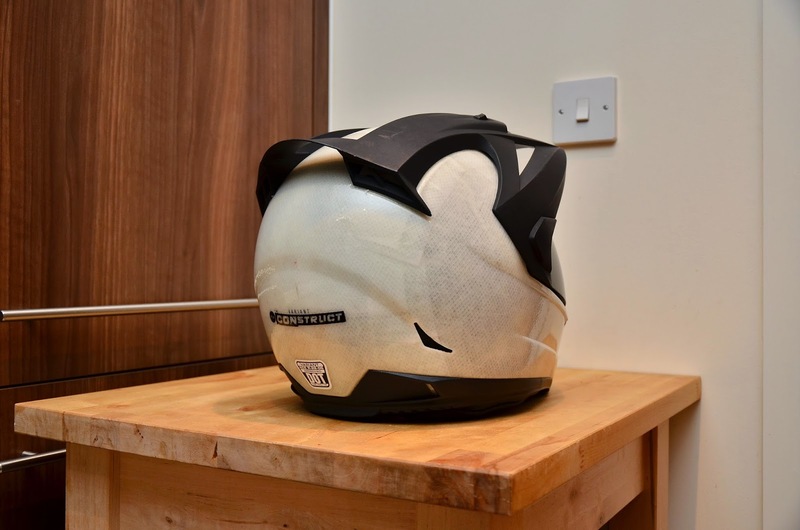 Classic schoolboy error—never, ever, leave a helmet where it is at risk of dropping onto a hard surface. No! Not a good place to leave a helmet! I slowly picked it up, fearing the worst. 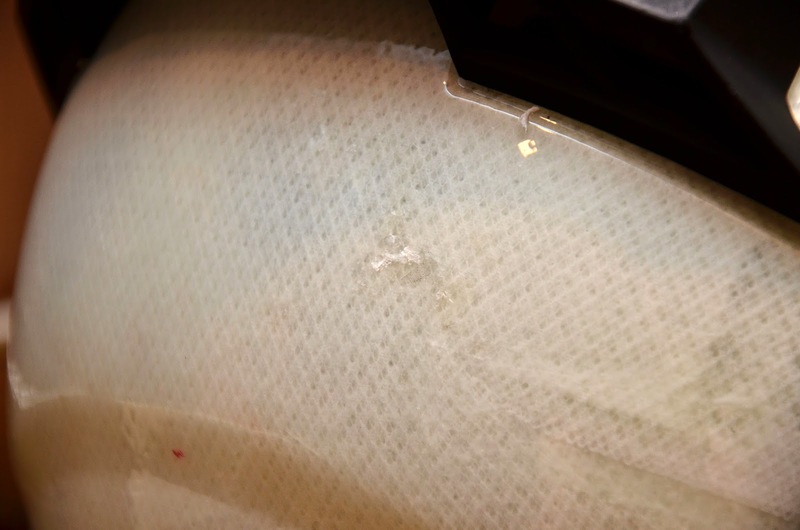 Sure enough, the resin had cracked, much like a stone impact on a windscreen. It is universally recommended from safety groups to helmet manufacturers that impacts like this compromise the structure of a helmet and therefore pose a safety risk. Chances are, in reality, it would be okay, but I’m not the sort to take undue chances with my life. In 2/5ths of a second I was £270 poorer. I love this helmet. It is the first one I’ve owned which lives up to its anti-fog claims. It’s the only full face helmet I’ve tried which doesn’t feel claustrophobic, providing nearly the same peripheral vision as an open face helmet. It’s also the first helmet I’ve owned which effectively clears rain, due to its bulbous visor which enables the airflow to push rain away from your field of vision. It is very quiet, and the peak on top generates just enough lift to counterbalance the weight of the helmet when travelling at speeds greater than 40mph, with no buffeting. My motorcycle insurance is useless for this because there is no coverage unless the damage occurred in relation to the operation of the bike (ie a crash). I did a little digging on the details of my home insurance policy, and sure enough, it covers accidental damage. I was somewhat hesitant to call because I have never had a home insurance claim since moving out of my parents’ home more than 20 years ago. I explained the situation to the very kindly woman on the phone who sourced a new replacement (like-for-like) during the call. For comparatively small claims like this they seem to simply reimburse (via a choice of cheque or direct transfer) which is fine with me. As a bonus, my policy has no excess and my no claims bonus is protected so I am not out of pocket. All those years of no claims are a good thing it seems. Note to self: more discretion in my choice of places to leave my helmet—even if only for a minute. New helmet now on order, and lesson learned. Anyone else ever have a face-palm moment like this? Rider assistance electronics—why all the hate?